For the past two years or so, comic book fans—and fans of good movies in general—have been anxiously awaiting Christopher Nolan’s inevitable follow-up to his Oscar-nominated masterpiece The Dark Knight. While that sequel is still a long way off—hitting theaters in 2012—at least we all know what to call it. 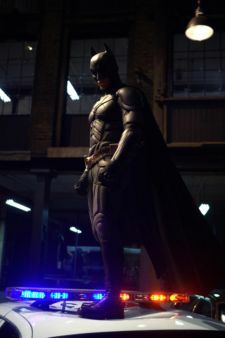 In an interview with the Los Angeles Times’ Hero Complex blog, Nolan confirmed that his third and final Batman film will be called The Dark Knight Rises. Hmmm. The Dark Knight Rises. Not quite as exciting as we thought it might be, is it? Indeed, a title says very little about the quality of the actual film (Nolan’s Inception would still be awesome even if it was called Sleepy Time Mind Spies). However, there’s something disengaging about simply adding the word “rising” to the end of the title of the previous film, especially considering the fact that the title progression from Batman Begins to The Dark Knight was so dramatic. All that said, it’s pointless to gripe about the title of a movie that’s still a year and a half away. Let’s move on. Nolan also confirmed that the Riddler will not be the villain in The Dark Knight Rises. Filmmakers have also ruled out Mr. Freeze and, barring some creative casting, we probably won’t be seeing the Joker either. Since Nolan’s Bat-verse is very much grounded in reality, I’m guessing the Penguin is a reasonable possibility, as are Catwoman, Bane, Black Mask, Deadshot, Firefly or even Harley Quinn. It’s tempting to rule out outlandish adversaries such as Clayface, Killer Croc and Poison Ivy, but let’s keep in mind that Nolan made the extremely supernatural Ra’s al Ghul semi-realistic in Batman Begins. Hell, we might even see a gritty reimagining of Clock King or Maxie Zeus. Nolan also revealed in the Hero Complex piece is that The Dark Knight Rises will not be screened in 3D. James Cameron weeps.